An agricultural box must provide the right resistance for transporting goods with guarantees. Therefore, an adhesive process that guarantees the highest quality in bonding the material is necessary. Meler systems for the application of hot-melt adhesives in agricultural boxes/crates are designed to exceed all expectations in terms of the robustness and durability of the container. Focke Meler has extensive experience in the application of adhesive in packaging processes, adapting to the particular needs of each product, manufacturer and end customer, offering the lowest possible price for each solution. 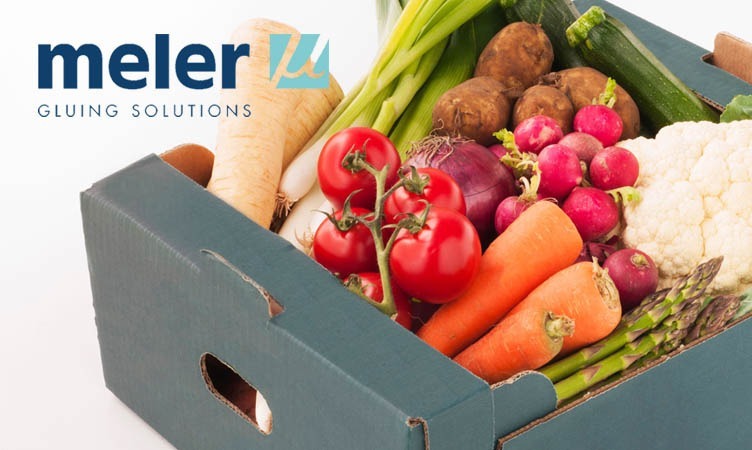 Focke Meler uses EVA adhesives, occasionally metallocene-based, both in compact corrugated cardboard fruit and vegetable tray forming processes and for forming fruit and vegetable trays for different box models and sizes. The installation is carried out on a standard fruit and vegetable box assembly machine. MICRON piston series, with 10 or 20 kg capacity and 19 cc pump. Heated hoses of different lengths and diameters. MELER applicators with built-in filter of 1, 2 and up to 4 injector modules. RA nozzles of 1, 2, and 3 angled shots at different degrees. Generally with 0.50 to 0.70 mm holes. Our extensive experience in moulds for fruit and vegetable “trays” provides complete trust and confidence based on our own design and manufacturing technology and high quality. Our piston pumps guarantee a high flow of adhesive and uniform firing. At Focke Meler, we adapt to the specific needs of each application, offering a very competitive price, an excellent pre and after sales service, with technical assistance all over the world and minimal delivery times (between 24 and 48 hours for standard material).